Regular delivery service is one of our most popular options, available to both private and business customers. Organising for a fixed schedule pickup and delivery of commercial goods, or other items is an excellent way to save time, effort and resources. The regular delivery service is suitable for a whole host of purposes, and covers a wide range of requirements. Our regular delivery service is very flexible and versatile, customers can secure fixed schedule delivery of commercial goods from point of purchase to specified address, businesses such as manufacturers, wholesalers, suppliers etc. can request for regular pickup and delivery visits so that goods and products reach other businesses or end customers. Raw materials needed for manufacturing of goods and products can also be delivered on regular basis by us from point of origin to a production site or plant. Laundry pickup & delivery, party venue supplies etc. you name – we will organise a regular delivery in London that wraps around your business requirements in full. Reliability and punctuality are vital when it comes to regular delivery services. We will always be on time for pickup, and we will always have everything delivered on time, whether that be as soon as possible, or at a customer specified hour. In the unlikely event that a pickup or delivery cannot be done due to vehicle or technical reasons, we will immediately dispatch a second vehicle and extra manpower to take over and complete the job without any delays or further issues. Availability – the regular delivery service is available for booking during all days, no exception, under flexible/extended hours. The frequency of pickup and delivery will depend entirely on your individual requirements, generally most customers need us on weekly, fortnightly or monthly basis, depending the nature of their business or establishment. Customers can change their regular pickup or delivery days and hours at any time. If the nature of your business does now allow for predetermined pickup/delivery times and days, you can inform us of your next pickup/delivery as soon as circumstances allow, we will do our best to meet your timeframe, and so far we have no trouble keeping up with floating schedule deliveries in London. 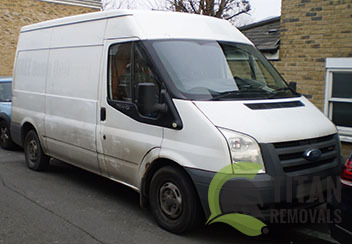 Drivers, vans, packing, securing – as always we take utmost care when doing regular deliveries as items we deliver are of substantial commercial value and damage or misplacement would be totally unacceptable. Our cargo drivers and helpers are qualified and skilled, they will perform any additional packing and securing of goods at pickup point as to ensure safe delivery, and safe journey for themselves and other motorists. The cargo vehicles we operate are specially equipped, and in good technical condition. The exact type and size vehicle we dispatch to you, will depend on the scale, weight, volume or number of goods / items that need delivering. Our regular delivery service is charged fairly, as prices are based on frequency, distance and volume or weight of goods / items being transported. Our price forming is strictly individual, so that our customers receive the best possible quote and pricing given the specific set of circumstances. Customising the service format – certain aspects of our London regular delivery service can be altered as per individual needs and wants of our customers. Should you have any specific requirements, please be sure to discuss those with our consultants. All members of our moving and delivery teams are very carefully vetted. All movers, drivers and helpers go through a rigorous screening process which has one purpose and one purpose only – to make sure that the people whom we will send to handle your regular deliveries in London will be the specialists best prepared to handle the job that you need assistance with. Call us today in order to learn more on the subject. The settlement status of London or Londinium in Ancient Rome is unclear. Before Boudica’s Revolt (the first battle in which the Romans lost the city), the settlement was classed as vicus (‘neighbourhood’ in Rome’ Republican Era). The vicus status remained until after recapturing the city after the crushing the revolt. Later on London’s status was changed to city, then changed again to civitas or tribal capital. London is the capital of England and one of the great cities of the world. No matter whether you come here for business or pleasure, to find further your education or just live in a truly cosmopolitan society, you will not be making a mistake. The River Thames is probably the most recognisable natural landmark in London. It divides the city into two distinct parts – South London and North London.